Unipak Fixed Power Factor Correction | Powerco™ Canada Inc.
Eaton Electrical offers a complete line of power factor correction systems up to 25,000V. 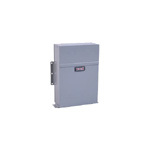 Eaton Electrical / Cutler-Hammer fixed capacitor banks feature multiple capacitor cells assembled in a single enclosure. Each Dry Capacitor Cell features Dielectric fill (self-healing metallized polypropylene) as well as discharge resistors for safety. Each Fixed Capacitor Bank is designed for high reliability and long life. These products are designed for applications that do not contain harmonic generating loads.